You simply can’t have Christmas time without panto! Us Brits do love the panto and the sillier the better. But we also love a good show with fantastic costumes, acting, music and dancing. Qdos Entertainment’s Robin Hood ticked all the boxes and more: A well-known Bafta-winning TV star? Check. Leads and an ensemble of comedy, TV and voice-over actors? Check. A seasoned West End star? Check. A mighty magician? Check. A group of international comedy acrobats known as The Acromaniacs? Check! A team of young talented dancers from Dancebox Studios? Check! We all know the story of Robin Hood, with his team of merry men, robbing from the rich to give to the poor, the evil Sheriff of Nottingham getting in their way and of course the lovely Maid Marion whom Robin is keen to woo. Throw in some clowning around, impressive magic tricks, a spirit of Sherwood, a rather scary 3D trip through the haunted forest, crazy acrobatics, dazzling costumes and stage sets then you’ve got yourself a winning pantomime. The show is fantastic fun for all the family with endless cheers, boos and screams from the children in the audience and plenty of cheeky laughs from the adults as the grown-up jokes and innuendos were well placed and consistent throughout the show. Of course, you must expect plenty of news, politics and current affairs creeping their way into the show too so prepare for insults, poking fun and outrageous laughter – we love it! Music and songs included some from The Greatest Showman and the classic annual Milton Keynes Panto rendition of Twelve Days of Christmas – watch out for those five toilet rolls kids!! 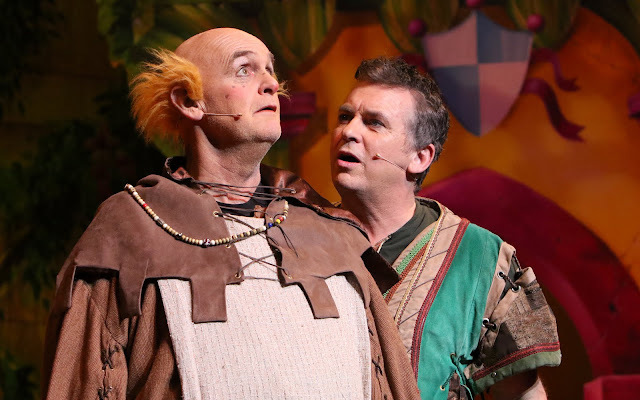 Starring cheeky and charismatic Shane Ritchie as Robin Hood, Peter Piper as Friar Tuck, Gina Murray as the Spirit of Sherwood, Pete Gallagher as the charming and dastardly Sheriff of Nottingham, Jamie Kenna as Little John, Phil Hitchcock as Merlin the Magician and the almighty comedy jumping Acromaniacs as the Merry Men. For tickets, head to www.atgtickets.com, the panto is running until 13th January. Be quick, performances are selling out fast!